Hotel Quality Tegel, Berlin. Quality Tegel Hotel Berlin. 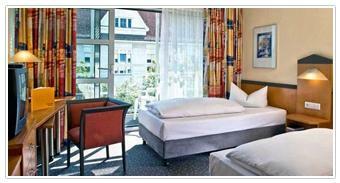 The Quality Hotel Berlin Tegel offers an innovative concept in accommodation and conference planning. The use of Feng Shui provides a harmonious, balanced atmosphere, so participants are relaxed, feel healthy and energized, resulting in the maximum absorption of the event topic. The accommodations are spacious and comfortable proposing the ideal place to come home and relax after a day around the city, whether for business or leisure. The hotel restaurant prepares high quality cuisine using the best products for a top of the line result. Come enjoy a holiday with unlimited and complimentary WLAN, a central location and a wonderful morning breakfast that awaits you with a wide range of choices to start the day off right.